Indica Books Varanasi, India, 2003. Translated from the french by Ken Hurry. The articles included in this book are part of The Mleccha’s exercise books. 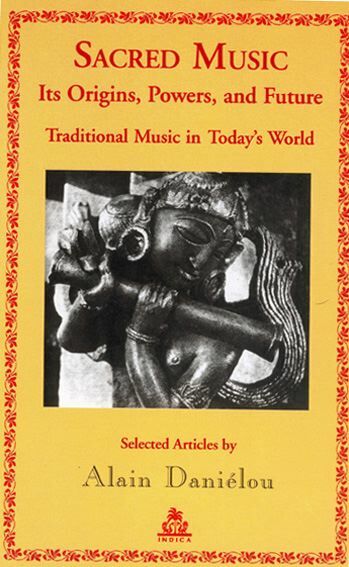 “Today, music from far afield’has become a reference for many specialists and connoisseurs. These treasures have inspired many contemporary composers. We owe all this to Alain Daniélou. Today the existence all over the world, and especially in the Orient, of music, which is as classical as that Bach and Mozart, is universally acknowledged: we owe that fact to Alain Daniélou’s farsightedness and unstinting efforts”. Noriko Aikawa, Director of the Intangible Heritage Section of UNESCO. By Jacques E. Cloarec, Le Labyrinthe, september 2002. The first book to be published by Alain Daniélou, in 1936, was a selection of articles entitled Le Tour du Monde. Since that time, over half a century ago, besides the works listed at the end of this volume, Alain Daniélou wrote hundreds of articles for journals, encyclopaedias, conferences, radio programmes, ect., which he did in various language, Hindi, French, English, Italian. These texts deal with a great variety of subjects concerning India, its religion, society, language, music and so on. Manycan no longer be found. With the author’s consent and, up to his death, under his supervision, Ideemed it would be useful to publish them according to their subjet matter, whence the idea of The Mleccha’s Exercice Books. In the languages of India, a Mleccha is a barbarian who is not born in the sacred land of India. In traditional society, a foreigner, whatever his origin, is assimilated to the caste of the Shudras, artisans and labourers, which is the most numerous caste in India, representing nearly about 80% of the Hindu population. As Alain Daniélou explains in his memoirs, The Way to the Labirinth, this status, which was for many long years, is in no way a barrier to knowledge. He could study with the Pandits and Brahmans in Banaras so long as he observed the proper rules for a good Shudra student, including vegetarianism (which is not usual in this caste), taking a daily ritual bath in the Ganges, never touching his master, nor entering certain parts of his house, and so on. Alain Daniélou became a disciple of the renowned sannyasi Swami Karpatri. He studied traditional cosmology and metaphysics with Vijayanand Tripathi, and the vina with Pt. Sivendranath Basu for several years. On Swami Karpatri’s orders, he was initiated into Hinduism with the name Shiva Sharan. This book contains the articles of The Mleccha’s Exercice Books dealing with the subject of music. the complete Exercice Books is published in french by Kaïlash publishers.